Need funding? Rapid Finance provides fast and easy financing solutions, so your business gets the attention and funds it needs. The application process is fast and approval is based on your business’s overall health, not just a credit score. Rapid Finance offers a suite of programs that can assist your business with a variety of expenses and day-to-day operations. Founded in 2005, Rapid Finance advertises its dedication to “entrepreneurialism” and has extended over $2 billion in funding to companies. Operating as an alternative to banks and other traditional lending institutions provides Rapid Finance with the flexibility to work with businesses of all sizes across a broad range of industries. With an A+ rating from the BBB, Rapid Finance is considered to be an established and reliable member of the growing community of alternative financiers. Rapid Finance’s goal is to not only provide funding to businesses in need, but also help businesses succeed and grow because of that funding. With an A+ rating with Better Business Borough and a 97% customer satisfaction, Rapid Finance provides a personalized and professional customer experience that caters to a variety of financing needs. Rapid Finance’s business advisors work hard to give their clients a smooth and seamless financing process. Not sure if there’s a financing solution for you? 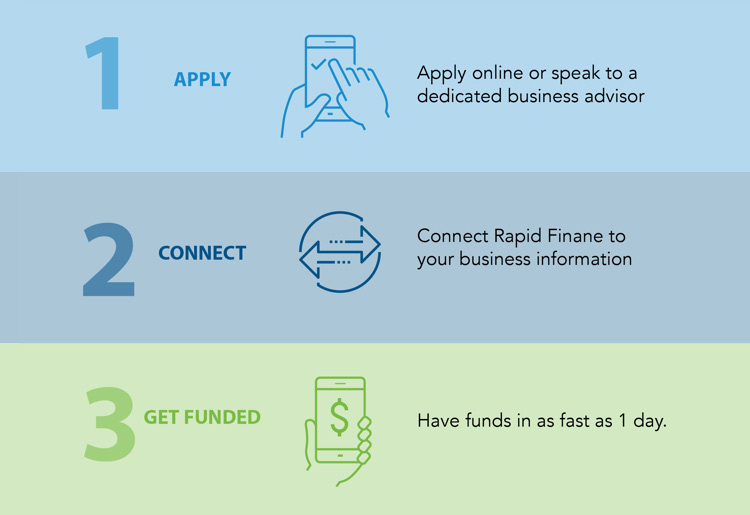 Rapid Finance has a vast network of options your business can utilize to get the funds you need- just fill out a quick application! Rapid Finance’s application process is simple and easy. Upon application, you will receive a free quote along with expected rates and fees. Approval may go through within minutes and funding may occur as soon as the day of application. There are no fees to apply for financing and you’re under no obligation to complete an application or accept funding once you’ve looked over the initial quote. Once you decide to apply for financing and move forward, an advisor will be assigned to your account to assist with questions. With flexible financing options and payment terms, Rapid Finance financing can benefit just about any small business. Applying for Rapid Finance financing starts with requesting a quote on the funder’s website. You provide basic business and personal information and are given the financing amount for which you may qualify along with information about the terms and the rates you can expect to pay. No fee is charged to get a quote, and your request puts you in touch with a business advisor who can explain which funding options are available and help you decide on the right one for your company. Rapid Finance advertises approval “in minutes with the longest wait time being a few hours.” This is comparable to other alternative lenders but much faster than banks. Upon approval, funding is deposited into your business account in as little as 1 day, but some transactions may take up to 7 days. Term lengths or estimated term lengths and payment structures vary depending on the type of funding you receive from Rapid Finance. Terms on small business loans may be as long as 18 months, and the borrowed amount is paid back through an automated clearing house (ACH). Payments are pulled daily from your business checking account Monday through Friday, excluding holidays. Merchant cash advance payments are made each time you process a credit card transaction. A percentage of every sale goes toward paying off the financing until the balance is paid. Multiple factors—including the size of your business and the industry in which you operate—impact the terms or estimated terms and rates you may receive. The expected costs are provided when you request a quote on the financing type for which you wish to apply. You can check your account online through the Rapid Finance site to see recent payments and check the remaining balance. The predictable payment schedule makes it easier to track your payment history and budget to ensure payments continue to go through on time. If you have questions or concerns about any part of the Rapid Finance process, you can contact the company via the customer service phone number or email address. Common questions are answered on two separate FAQ pages: one for general questions and another specifically addressing business financing. Visit RapidResources to access a variety of business articles on the company blog or view informative SlideShare presentations. Rapid Finance also provides an e-book for small business owners and a white paper to guide companies in defining and honing their sales processes. 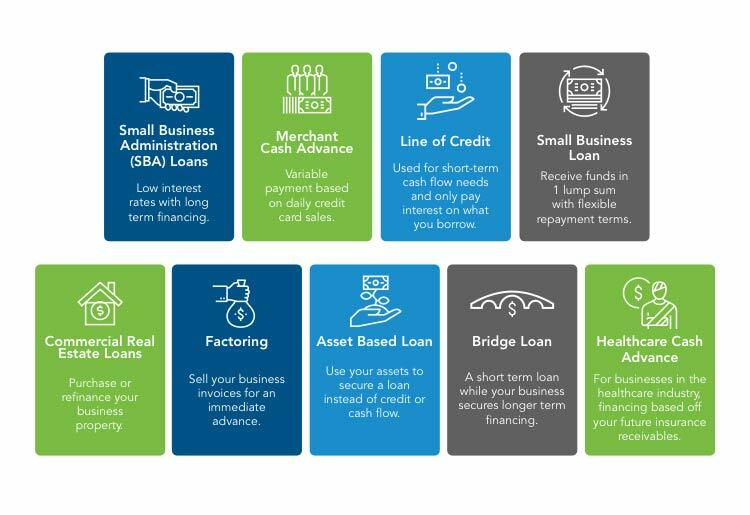 These resources provide additional information you can use to aid in your decision on what type of loan to choose and whether or not Rapid Finance is the right lender for your business.